It started with the seed of an idea… Julie and Tina were chatting about ways to celebrate the 10th anniversary of the Academy of Floral Art with the local community when they had their eureka moment: how about Exeter Floral Trail for the Chelsea Fringe Festival? And – as with all great ideas – what started as a modest plan blossomed into something much larger. 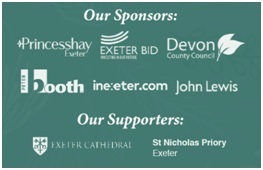 In this case, it blossomed into a free, city-wide, three-day happening in support of AgeUK Exeter featuring 19 beautiful floral designs in shops, historic buildings and restaurants and generously sponsored by Visit Exeter, Devon County Council, Princesshay and John Lewis. 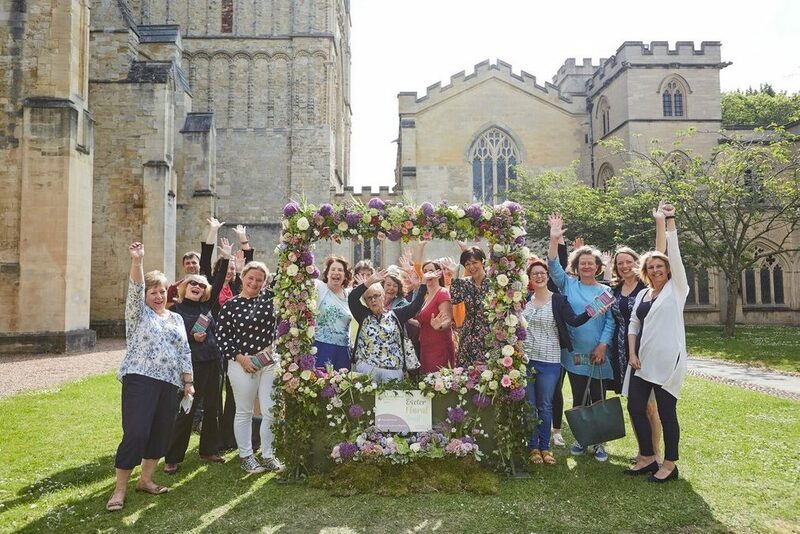 The sun shone all week long as 20 Academy students past and present stepped up to design and create the bespoke displays including a freestanding, floral selfie frame in the grounds of Exeter Cathedral, a teapot at Cath Kidston, floral screens at Lloyds Lounge and Music Unlimited and elegant floral footwear and coordinating handbag at White Stuff. 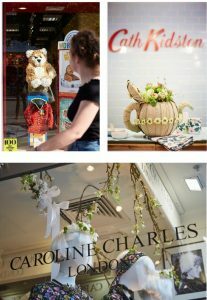 A tower of flower-filled books appeared in Waterstones; a cute flower bear adorned the window of Build-a-Bear; flower crowns and flower-filled handbags popped up in Caroline Charles and Mantis; and an exquisite table-runner of flowers dressed the furniture department at John Lewis. 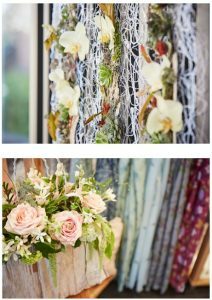 Out at Exeter University, we staged an installation of hanging chairs covered in fresh flowers, whilst inside the historic St Nicholas Priory we styled a river of paper flowers, which had been handcrafted by AgeUK Exeter’s Craft Club members. 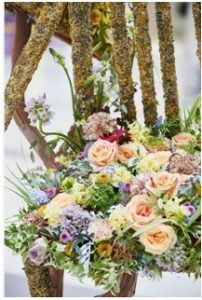 Exeter’s independent florists – Trugs, St Leonard’s, Jane’s, Dunstan’s and Blooms – all designed their own fabulous floral displays for the Exeter Floral Trail.